Prayer | Dr. Justin Imel, Sr.
Tammy was cooking supper, the boys were doing homework at the kitchen table, and I was in the living room. My phone vibrated; Mom had texted, and her message was simple: “Pray hard.” I called, and, through the tears and anguish, Mom told me that Dad was being rushed into surgery and things did not look all that promising. I was devastated – I called Tammy into the living room, told her what was going on and that I couldn’t eat (I cannot eat when I’m upset), and I went to our bedroom – and, through the tears and the screams – I asked God to spare Dad’s life. I emailed my coworkers at Heritage Christian University and asked them to pray. Dad came through surgery, and, while he has had a long and difficult recovery, continues to preach the Word on God’s behalf. I’m thankful to God that He, on that occasion, spared Dad’s life. You and I both know, however, that God is not at all bound to answer my prayers the way I wish. He is sovereign. He is God. He does what pleases Him to further His will (think Jesus praying in the Garden in deeply tormenting anguish). Yet, prayer can change God’s mind (think Hezekiah’s extra 15 years), and we pray. We pour our hearts out to God in expectation of an answer. Yet, we pray, as did our Lord Jesus in the Garden, for God’s will, not our own to be done. As I give thanks for God’s bountiful blessings this month, I cannot forget prayer. I’ve prayed long and hard, and God has never failed to answer. He hasn’t always answered me as my whims and fleeting thoughts wished, but He has answered as fits His purpose and His will. I’ve been driven to my knees over my dystonia, and God hasn’t taken it away. Yet, I’ve learned trust and prayer and courage and humility in ways that would never have been possible otherwise. Oh, yes, God has answered my prayers, but He has answered them in a way that continues to mold me into the vessel He needs me to be, and I’m thankful. He has shown over and over and over that He knows far better than I – He leads, I follow; He blesses, I receive; He answers, I pray. Today, I want to provide reasons I’m thankful for prayer. I can pray for wisdom. I tend to be stupid; I make foolish decisions; I desperately need wisdom. God answers when I pray for wisdom (Js 1:5). I can pray for workers in the kingdom. I have been saved from my sins through the redeeming blood of Jesus. Why would I ever wish to keep that gift for myself? In prayer, I am able to pray for workers to be sent into the vineyard (Matt 9:37-38). I can pray for the church. The church is the precious bride of Christ. Why not pray that she be kept free from error, that she stands under the test of persecution, and that she enlarges her boundaries? Read the epistles of Paul and see how often he prayed for the local church. I can pray for those who preach the Gospel. Preaching the Gospel is the most glorious work in all the world – I would much rather my sons be Gospel preachers than President of the United States. Yet, as I know full well, the work of preaching the glorious Gospel of Jesus Christ takes its toll and prayers are both sorely needed and appreciated. Throughout Paul’s epistles he often asked churches to pray for him. I can pray for the world’s leaders. Syrian refugees. Attacks in Paris. Threats around the world. At this moment in history (as with every other moment), our leaders need prayer, and God, through Paul’s inspired pen, instructs us to pray for world leaders (1 Tim 2:1-4). Why not get on your knees now and ask for God’s richest blessings on the leaders of the world? I can pray for the sick. Because we live in a fallen world of sickness and death, every church in the world has a prayer list a mile long. Why not take the prayer list from where you worship and implore the Father for His will to be accomplished in the lives of the suffering? After all, we’re to pray for the sick (Js 5:15-16). While the context of James 5 is unmistakably spiritual, not physical illness (at least in my opinion), the principle of praying for the sick remains. I can pray about ALL of my burdens. No matter what is bothering me – from a sick pet to the bills in the mailbox – I can pray for God’s richest blessings. We may cast “all your anxieties on him, because he cares for” us (1 Pet 5:7). Oh, what a blessing to take everything to God in prayer! I’m thankful – oh, so very thankful – that the Creator of all will bend His ear to listen to me and take all my burdens away. 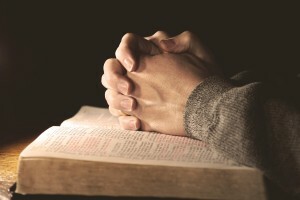 Why not thank God for prayer today? Why not take your burdens to Him in prayer? Oh, by the way, don’t forget to ask Him to walk with you – I know He’ll walk with you as He has walked with me. This entry was posted in 30 Days of Thanksgiving, Faith, Prayer, thankfulness. Bookmark the permalink.